Campbell Soup stocks soared after news came out suggesting the company could be bought by Kraft-Heinz, one of 3G Capital and Warren Buffett’s pet projects in the food sector. Even though the deal is highly unlikely to happen, these rumours point to a much larger story in food processing. Since 2013, the “acquire and cut” modus operandi worked well and made Kraft-Heinz a more profitable enterprise. The 3G Capital-Buffett duo acquired Heinz in 2013 and then acquired Kraft two years later. Cost management and rising margins were key to make these businesses profitable. But organic growth is painfully absent, meaning Kraft-Heinz needs another deal and fast. After its epic failure to purchase Unilever in 2017, it’s back on the hunt. For Kraft-Heinz, Campbell Soup offers a different scenario. The Kraft-Heinz and Campbell Soup deal does not make sense from a strategic perspective. 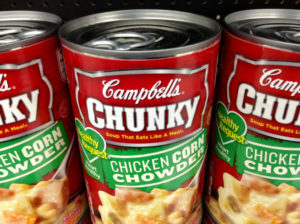 For one, Campbell Soup, despite its iconic brand equity, is essentially a North American player with inside ownership. The founding family still owns a good portion of the company and would need to concede to any deal. In addition, to grow, Kraft-Heinz would need more global brands in its portfolio. Campbell Soup is a relatively small company with major issues in its primary business: soup. Soup is not a portable solution and is essentially impractical for consumers in a hurry and who want to eat something on the go. Additionally, most product lines offer unhealthy and unnatural alternatives for modern standards. This can be equated to two strikes in today’s changing food demand landscape. Campbell Soup has tried to revitalize the category in many ways but has not been successful. The reality is that most packaged food companies would dream of seeing their top line grow 1% yearly. As an example, Campbell Soup sales have declined for the last three years and it is desperate to keep its sales stable. Kraft-Heinz sales, on the other hand, fell more than $200 million in the last year and are expected to fall even further this year. The broader picture, however, signals troubled waters ahead as times are tough in food packaging. Campbell Soup announced recently that its chief executive, Denise Morrison, was retiring and the company would conduct a strategic renewal process for its entire portfolio. Morrison became the 15th CEO to leave the helm of a major food processing company in two years. The turnover is painfully high. What can make matters worse are current trade wars triggered by the United States. For now, most new U.S. related measures have been non-agricultural, commodity-centric measures. New tariffs have spared the food packaging sector and have not forced companies to alter their global food supply chain strategy, but that could change. Like Campbell Soup, Kraft-Heinz’s dependency on North American business is acute, however, retaliatory measures against the United States could start affecting these companies over the next 18 months. That’s why time is of the essence. Kraft-Heinz not only wants to expand its portfolio and grow globally, but it also needs to hedge against Washington’s erratic trade policies. The Kraft-Heinz and Campbell Soup deal may not happen, if only for financial reasons. For Kraft-Heinz, Campbell Soup is a relatively small player that wouldn’t make much of a difference. Its market capitalization is barely $13b U.S. This could be an interesting stepping stone for Kraft-Heinz as it looks for its next target. Rumours are rampant in food packaging. Everyone wants to grow—Kraft-Heinz most of all. They missed a $140b U.S. deal to purchase Unilever a while back and the company has not ceased to look for the next opportunity. The company’s next hit can better its position in the grocery business, closer to consumers who are slowly moving away from major national brands. Given the climate, chances are that rumours of acquisitions will continue for some time. Mondelez, Kellogg’s, few can tell what is likely to happen. What is certain is that fewer players will remain in the sector in a few years from now. This has given smaller, more regional players new hope. As the giants fade away, a new crop of food companies is emerging and that’s not necessarily a bad thing. Consumers are now looking for something different, something major players seemingly cannot deliver.